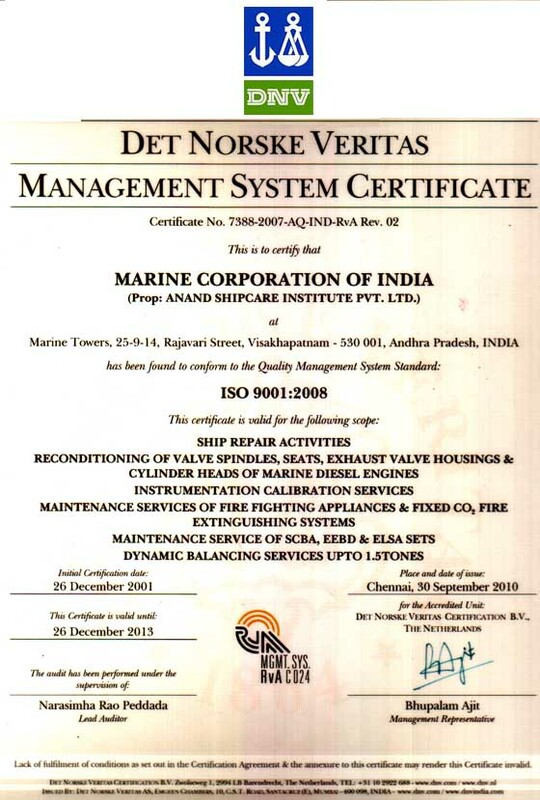 Marine Corporation Of India was founded in 1989 by Lt.Commander.P.S.ANAND,Indian Navy(Retd) F.I.MAR.E. (India), M.I.MAR.E (London),Chartered Engineer (U.K), together with his son Er.D.S.ANAND(Shahji Anand),B.E., F.I.MAR.E., F.I.E, F.I.I.W., Chartered Engineer, M.B.A. (USA). It's a father & son team catering to the needs of vessels calling at Visakhapatnam Port, Kakinada and Paradip Port in particular & also attending to calls for repair works in India and abroad. Besides father & son, the staff comprises of highly qualified, dedicated and experienced marine engineers, technicians and highly skilled workers of various trades.